Bucket lists have never really been my thing. I want to do so much that I can’t narrow it down. However, I have always dreamed of going to the Sahara Desert. I saw deserts in music videos and movies when I was younger and assumed every desert was the Sahara. To finally be here was a milestone for me. 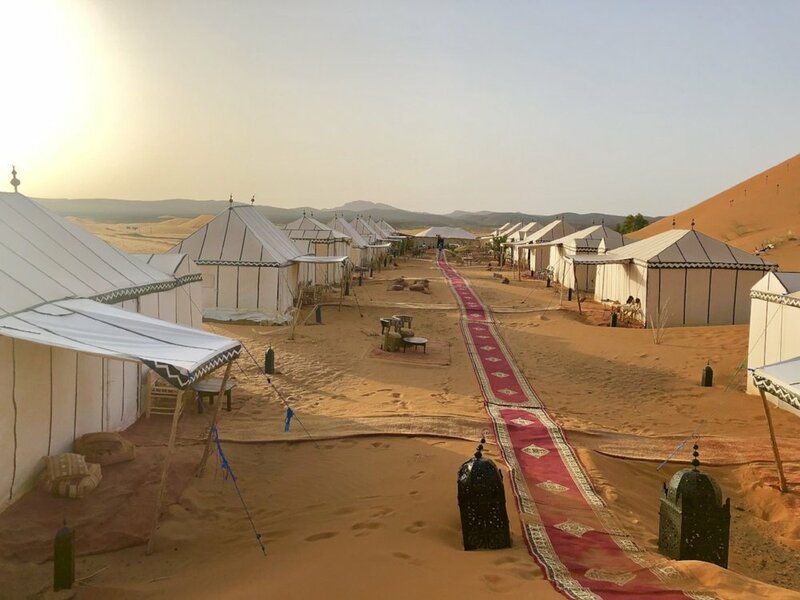 I had the privilege of luxury/glamorous camping (aka ‘Glamping’) in the Sahara Desert of Morocco with Desert Luxury Camps. This experience was the highlight of my entire 10 day trip to Morocco. We arrived in Merzouga a little after 6am and was picked up by our driver from Ksar Bicha. If you arrive in Merzouga in the morning, I highly recommend you contact them and stay here for the day since your camp won’t pick you up until later in the day after 5pm. Capturing these photos were far from easy. Hiking up the dunes in the Sahara heat while wearing a gown was far from fun or glamorous, but I was grateful to be here and I wouldn’t have traded it for anything else. Between the warm breeze, the soft sand in my toes, and that unforgettable sound of silence, this was arubably one of the best experiences I’ve had as a traveler. Our camp site and private tents were flawless. Each tent had its own bathroom and shower. We were welcomed with drinks and light snacks followed by an amazing dinner. After we ate, the camp staff played music and performed traditional Berber dances for us under the stars. If there is one thing I could convince you to add to your bucket list if you have one, this is it. It’s an amazing experience and worth every part of the journey. Visiting here showed me that We get caught up in the noise of our every day lives (especially for us busy city living folk) that we don’t appreciate how loud yet soothing and serene silence can be. How to get here: There are a few ways to get to Merzouga which is the last town before the desert in Morocco. Due to the landscaping, there are no flights or high speed trains to Merzouga. The only way to get there is to take a bus or a taxi. Depending on where you are coming from, this can be a journey. We took an overnight bus from Fes to Merzouga that was 8 hours long and the tickets were about $18. When to Visit: I visited Morocco in June when it was rather warm. Any time after July may be unbearable due to the heat. The cooler months are from October to February. 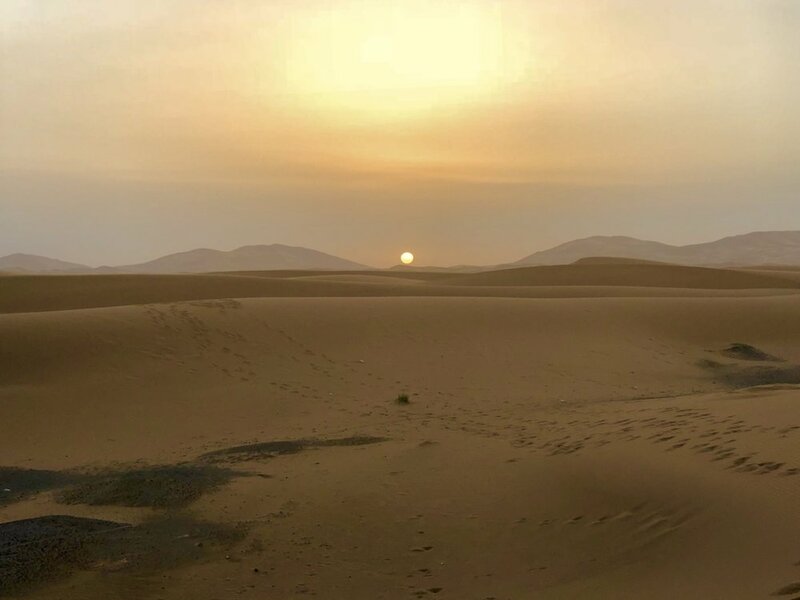 However, during these months the Sahara can get rather cold after sunset. A scarf for your head to protect you from the sun (I purchased mine from a shop in Merzouga for about $10. It came in handy) . Hydration is Key. Bring water and light snacks. Carry your clothes in a small backpack for camel trekking. Your luggage can’t sit on the the camel. Wear light and loose fitting clothing as fitted/tight clothes will stick to you in the heat. Wear something a bit warmer for the night as the temperature drops after the sun sets. Wear closed toe shoes for camel trekking. Then Go barefoot in the sand dunes. For camel trekking I recommend loose fitting pants as opposed to shorts/skirts or dresses.